Beyond SCN1A. Dravet Syndrome is a severe fever-associated epileptic encephalopathy. While the large majority of patients with Dravet Syndrome carry mutations in the SCN1A gene, the genetic basis is unknown in up to 20% of patients. Some female patients with Dravet-like epilepsies have mutations in PCDH19, but other than this, no additional major gene for typical Dravet Syndrome is known. In a recent paper in Neurology, de novo mutations in GABRA1 and STXBP1 are identified as novel causes for Dravet Syndrome. In addition, several SCN1A-negative patients were shown to have mutations in SCN1A that were initially missed. Negative becomes positive. Carvill and collaborators performed exome sequencing in 13 patients with a clinical diagnosis of Dravet Syndrome that were negative for mutations in SCN1A. Gene panel analysis was performed in 67 additional patients using next-generation gene panels. In the initial cohort of 13 patients, 3 patients were shown to have a de novo mutation in SCN1A, a finding that was missed during the initial SCN1A testing on clinical grounds. Missed SCN1A mutations in Dravet Syndrome have been reported by several groups, and it is usually assumed that up to one third of patients with Dravet Syndrome that are negative for SCN1A on routine testing actually have mutations in this gene. This phenomenon indicates how tightly the Dravet Syndrome phenotype is linked to the SCN1A gene. Massive parallel sequencing technologies may be able to pick these mutations up, as NGS is a digital technology, assessing the number of reads rather than visually interpreting sequencing peaks. In most cases, however, the reason for missing the mutation in the first place is not known. GABRA1. In addition to SCN1A, mutations in GABRA1 were found in four patients with SCN1A-negative Dravet Syndrome. GABRA1 is known as a gene for familial Juvenile Myoclonic Epilepsy that has been reported in French-Canadian families. In addition, a single GABRA1 de novo mutation was described in the Epi4K publication. Carvill and collaborators find three de novo mutations and a fourth mutation for which segregation could not be assessed. However, the additional mutation was in the same position as one of the de novo mutations, indicating that also this mutation is probably pathogenic. There are some unusual features in the four Dravet Syndrome patients with GABRA1 mutations. For example, 2/4 patients had atonic seizures, a seizure type that is not frequently seen in Dravet patients. In contrast, all four patients had hemiclonic seizures, a seizure type that is characteristic of Dravet Syndrome. This underlines that the phenotypes of the patients may actually be indistinguishable for classical SCN1A-related Dravet Syndrome with a few minor exceptions. STXBP1. The gene for syntaxin binding protein 1 is becoming the chameleon of epilepsy genetics. STXBP1 mutations were initially described in patients with Ohtahara Syndrome and subsequently found in other early onset epileptic encephalopathies. Carvill and collaborators now find de novo mutations in three patients with SCN1A-negative Dravet Syndrome. The patients have a typical age of onset for Dravet Syndrome in contrast to the previously described early-onset cases. As a feature unusual for Dravet Syndrome, 2/3 patients had tonic and/or atonic seizures. In summary, the current publication extends the phenotype of STXBP1 encephalopathies to patients with a later onset. The two scenarios on how mutations in SCN1A, GABRA1, and STXBP1 may result in Dravet Syndrome. According to Scenario A, all mutations have an equal probability of occurring, but the phenotypic range is different. The “core phenotype” would describe the most characteristic phenotype with these mutations, but may be different for all three genes. According to Scenario B, the phenotypic range is similar, but the mutations have different probabilities of occurring. Scenario B would stipulate that all phenotypic differences suggested so far for these genes might be the results of recruitment bias. According to the recent literature, Scenario A is favored over Scenario B. The phenotypic range – two models. How can two completely different genes present with the phenotypic features of Dravet Syndrome, a disease that is considered to be almost exclusively related to mutations in SCN1A? I would like to suggest two different models to think about this that I have outlined in the figure. 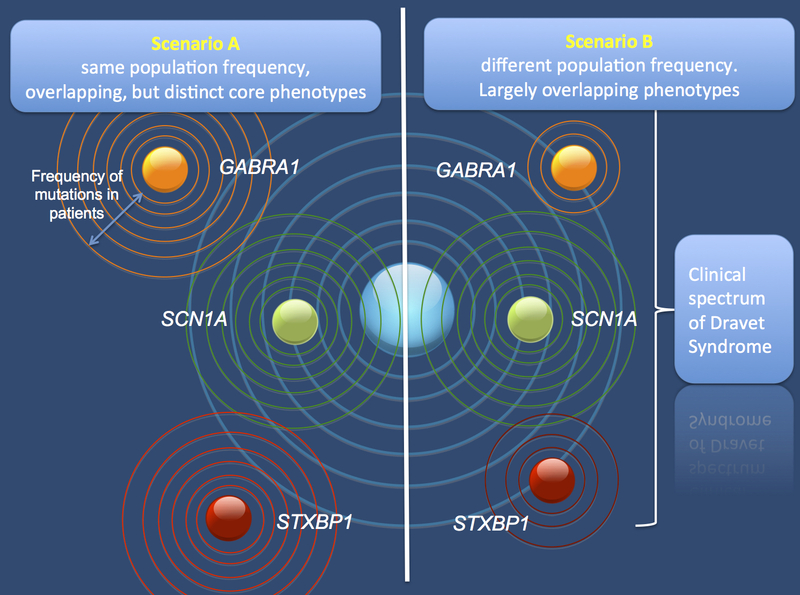 According to Scenario A, de novo mutations in SCN1A, GABRA1, and STXBP1 are equally common in individuals, but present with different “core phenotypes”. While the core phenotype for SCN1A is tightly linked to Dravet Syndrome, the core phenotype of GABRA1 and STXBP1 are different; the range of phenotypes simply touches upon Dravet Syndrome, which is only present in a small subset of cases. According to Scenario B, the Dravet phenotype is an equally common presentation for all three genes, but the frequency of mutations is different. According to this model, Dravet Syndrome is the final common pathway of various genetic alterations. While there is more evidence for Scenario A, the truth will probably be somewhere in the middle. Over time, we will learn more about the common mechanisms that lead from three distinct genetic alterations to a single common epilepsy phenotypes. Lessons. In summary, the paper by Carvill and collaborators finds de novo mutation in GABRA1 and STXBP1 in patients with SCN1A-negative Dravet Syndrome. This finding suggests that successful gene identification is possible the ~20% of patients with Dravet Syndrome without a molecular diagnosis, opening up novel therapeutic avenues. Disclaimer. As with previous posts, I just wanted to indicate that I am a coauthor on the current publication by Carvill et al. This entry was posted in 2014, Bioinformatics, Epileptic encephalopathy, Papers and tagged alternating hemiclonic seizures, atonic seizures, CHD2, Dravet Syndrome, epileptic encephalopathy, Febrile Seizure, GABRA1, gene panel analysis, molecular inversion probes, SCN1A, SCN1A-negative Dravet Syndrome, SCN1B, status epilepticus, STXBP1, whole exome sequencing. Bookmark the permalink.